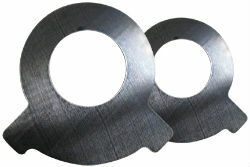 SPIROL specializes in Heat Treated Shims. Shims are heat treated to improve mechanical properties. Through hardened Shims are heat treated to increase hardness, tensile and yield strength to provide a more robust component. Case hardened Shims are produced with the surface being considerably harder than the core. This results in a Shim that has the flexibility to avoid fracture due to the soft core, yet provides an excellent wear surface. A Thrust Washer is a type of Shim that is often either through hardened or case hardened to meet the specific requirements of the application in which it is used. SPIROL stands alone in the industry by heat treating prototype and short-run steel Shims for commercial applications in-house rather than relying on outside vendors. This enables us to shorten delivery times, reduce costs and maintain total control over quality. Our statistically capable heat treating process delivers through hardened and case hardened product with precision accuracy and no warpage. All of our Heat Treated Shims can be used in Single or Edge Bonded configurations.